Hey Everyone! Normally, it’s my husband Kenny who writes the blogs, emails, and does all the business side of this whole business. I just live in a studio and stress about what to make next. Well, I thought I would mix it up and write one myself about something I felt passionate about, American Style Haunted Houses and Universal Studios Halloween Horror Night in Orlando. As many of you know, I say all the time how I grew up in an American Style Haunted House and I have to say it like that, because people in Scotland assume I grew up with ghosts and poltergeist activity if I just say Haunted House because they have real haunted houses here, so understandable I have to clarify. I did not grow up with doors slamming and books flying at my head. From my early teens, I learned the art behind the scare, how to make a normal room in a building feel like a cannibal’s kitchen. How to create a setting to feel as if the world as turned upside down and nothing is normal anymore, if it ever was. It is truly an art, making people believe death is around the corner, in a place with so many safety regulations that you know the fire marshal by name. The expression “The Devil is in the Detail” comes to mind when I think of how Haunters (individual who creates haunted attractions) create an experience that makes you feel as if you have walked into a kitchen for example. There are dirty dishes waiting by the sink, a towel laying around, and maybe a few magnets on the fridge. A kitchen in a Haunt should look, feel, and smell like the one you have seen before with the exception for a few bodies lying around, but who are we to judge. A great example for this is Disney…I know Disney and haunted houses do not mix but wait. Disney is amazing at making you feel as if you have entered another world. For example, The Little Mermaid ride at Disney World smells of seawater, they have shells in the walkway to look more like sand and the lights on the ceiling are manipulated to make you feel as if you are underwater. Next time you go to a haunt, look at the details because that is truly what shows you the difference between an average haunt and something great. 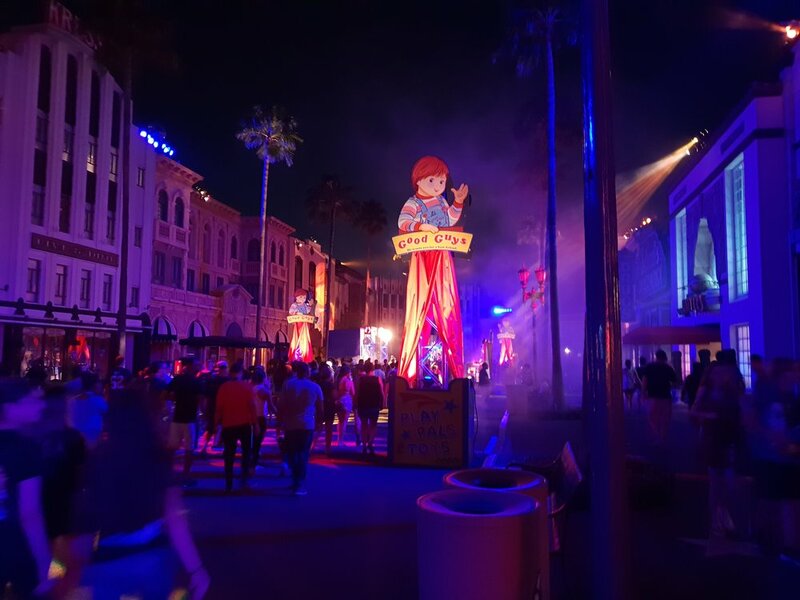 Last week we attended Universal Studios Halloween Horror Nights (HHN) in Orlando on their opening night. The detail in all their attractions are out of this world. Scary Tales: Deadly Ever After has a Hansel and Gretel room what smells like baked goods, and the candy and treats that line the walls are so real you want to take a bite. This was not the only scene in this haunt that visually filled my heart with joy, as the entire haunt has this level of detail. I honestly could have been in there for hours looking at all the detail and would have still missed something. Universal won me over with this haunt but all of their TEN haunted houses are to this level of detail, so why wasn’t I scared? Maybe, I never felt alone, I never felt unsafe and I never felt as if I was somewhere I shouldn’t b.
It’s hard to feel alone when you have hundreds of people around you waiting in line but oddly most haunts can pull this off incredibly well. When you enter, you leave everyone behind, only your group goes into the haunt. It’s as if you have entered the Zombie Apocalypse and this is now your survival group. However, we never felt that. When you arrive at HHN haunt you enter as a conga Line, only there is no catchy music or drunk relatives. You experience this haunt as one long line. What this means is I watched everyone get scared before me so when it was my turn I knew Sam was going to pop out behind the hidden wall and that a puppet was about to swing out. It was frustrating. I felt cheated from a scare. I even thought I was being smart, I thought I would slow down and create distance between the people in front of me. Their security team was vocal in telling us to speed up and keep moving. Speaking of security, the haunt is littered with them. Do not get me wrong, every haunt should have a strong security team ready for anything but most haunts have them hidden, out of sight to help create that isolated feeling. Anytime I saw their security team I instantly felt safe. Not a feeling I want when trying to be scared. During a tour, I asked about this and they explained they have visible security to cut down on customers being violent with actors. This is something I understand but can we avoided when splitting groups, having a follower and reading a crowed before they enter. This is how most haunts avoid this. HHN has amazing scare zones, the actors interact with guest and it is a great experience to walk through. My personal two favourites are Vamp 85: New Year’s Eve and Twisted Tradition. Vamp 85 has 80’s style Vampires crawling through the streets with 80’s music in the background. With Thriller dance offs and actors natural ability to make you feel uncomfortable. This one is a must see for me. Twisted Traditions provides a Trick R Treat vibe with Jack-0-lanterns in the tress and actors dresses in vintage style costumes. It is visually breath taking and I wish they had more of this because I could have walked up and down this zone all night; I honestly wish they did the opposite and had Safe Zones. It would have kept everyone on edge and could have kept the long lines entertained. The lines! I can’t express enough how glad I am that we got fast passes because the lines often had well over an hour wait time which I’m sure felt longer without any entertainment. 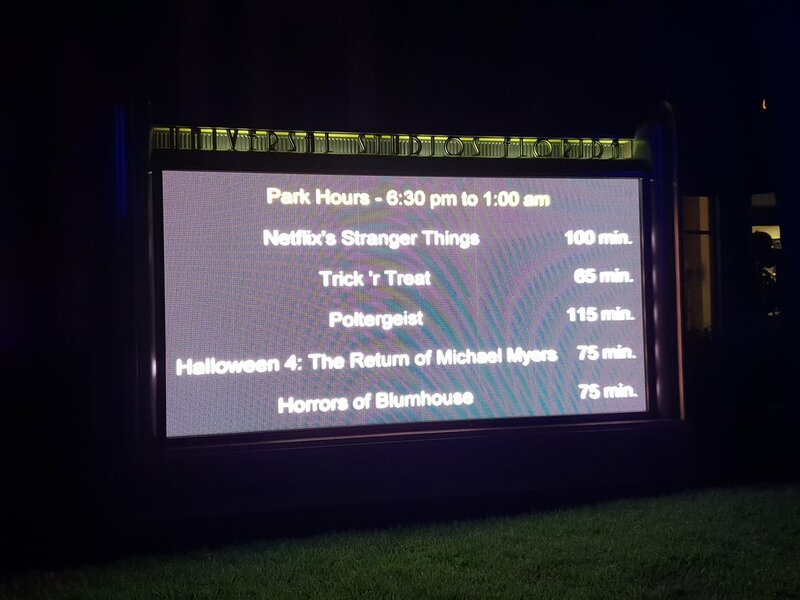 Having said that once you have paid for both the tickets and the fast pass you have already put out a lot of money so HHN doesn’t come cheap. They have one show Academy of Villains: Cyberpunk and it was great! We enjoyed the choreography and the audience interaction. It was a nice break from the haunts and scare zones but stayed with the theme of HHN. They also had some of their main attraction rides open for the night, this pulled us out of the theme of the night but from a business stand point makes perfect sense, why have all these big attractions and not use them? It definitely works as we found ourselves excited for Harry Potter and ended up buying ourselves wands and spending a good 45 minutes wandering around Diagon Alley! All and all I’m glad I went to experience this first hand. I was disappointed because my expectation was a tradition I grew up with and this wasn’t it. Universal leans towards getting as many people into the haunts as possible and not on maximising the experience once your in there. I think all of the problems I had with the night were linked…if you have safe zones instead of scare zones then it takes you longer to walk around the park as you would be constantly in a battle not get the crap scared out of you. More walking around the park means less people standing in huge lines which then allows you to put people through your haunts in smaller groups, giving them a more intense experience which is the whole reason they are there in the first place. We would definitely recommend going on the RIP behind the scenes tour as you will get a clear view of all the details of the haunts in the light of day and a very informative tour guide to tell you some of the secrets behind how its done and will allow you to ask all the questions you want! (we asked A LOT!) You can also take pictures in certain area’s of the haunts but not of everything. If your from the UK and your going on Holiday to Orlando whilst HHN is on then we would still recommend you go visit it to see first hand what its like, you may love it more than I did. A lot of my thoughts on this come because to us, the detail and scaring the crap out of people are more important than getting huge numbers through the door.